Morning Two’s greatest success story was a manga that began running in its very first issue, Hikaru Nakamura’s Saint Young Men. At one level, it is a slice-of-life comedy about two with-it hipsters sharing a Tokyo apartment. They squabble over vegetarian recipes; they experiment with a boutique T-shirt business, and they go shopping for noodles at the corner store. But Nakamura’s high concept has incredible bite, because these young men are really Buddha and Jesus, roughing it in an earthbound vacation. In this month’s chapter, they argue about the washing up, and then go on a trip to Ikea, because even God-made-flesh needs a working hob and an extractor fan. Buddha enthuses about how idyllic life must be for all those Viking gods and Valkyries in their beige Swedish wonder-kitchens. Jesus goes a bit crazy in Home Furnishings, and then realises he has to carry his purchases home. Nakamura’s storyline injects a much-needed humanity and humour into figures usually viewed only through translations of ancient books. Jesus is a resolutely happy person, who can laugh at the fact that schoolgirls mistake him for Johnny Depp. He runs a blog about TV drama, and frets about how to keep his crown of thorns dry in the shower. Buddha likes reading manga (particularly Osamu Tezuka’s famous Life of Buddha), and has an irritating ability to somehow get infinite lives whenever he plays a video game. This could have all too easily gone horribly wrong. Nakamura is well aware of this, and has been reluctant to allow her manga to receive an English-language edition, because she is afraid of the likely knee-jerk reaction from the Christian Right in the USA. This doesn’t appear to have stopped it getting translated in Italy (the home of the Pope), or in Spain (the home of the Spanish Inquisition – nobody was expecting that). This is a sad state of affairs, because Saint Young Men is a truly charming story, rich with humour and compassion, and oddly respectful of its protagonists. Its satire is not directed so much at them, but at the modern world in which they find themselves, repeatedly confronting 21st century customs and attitudes with the nature of old-world religious figures. If you think that gay marriage causes hurricanes, that tattoos will send you to Hell, and that a prawn cocktail is forbidden, then you are never going to like Saint Young Men. If you believe that “reverence” means never laughing at absurdity or imagining “what would Jesus do”, then this manga is certainly irreverent, and that makes it literally blasphemous. Nakamura is an equal opportunities satirist, and throws in a bunch of other gods and goddesses – this is typically Japanese eclecticism, but unlikely to play well with anyone who refuses to accept that others believe differently. Jonathan Clements is the author of Anime: A History. 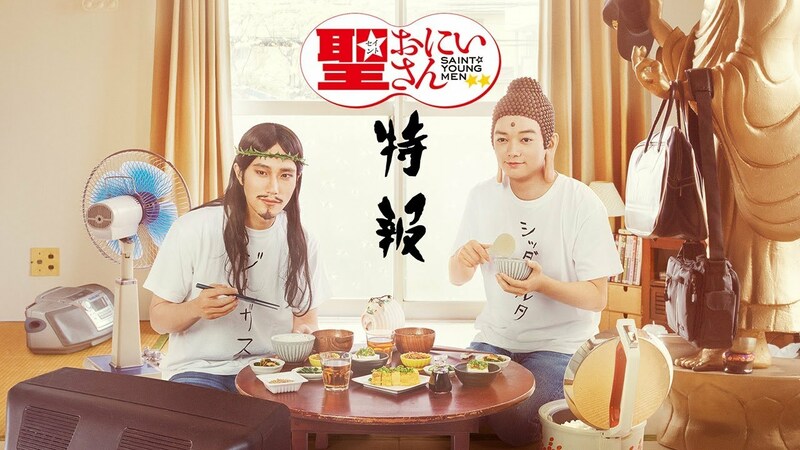 This article first appeared in NEO #144, 2015, and is reprinted now because of the Saint Young Men live-action TV show, currently creating waves online.